Voters in Japan have been going to the polls in a snap general election, giving their verdict on Shinzo Abe’s government after almost five years in power. Forecasts suggest the prime minister’s gamble is likely to pay off, even though many Japanese people didn’t want this election now. 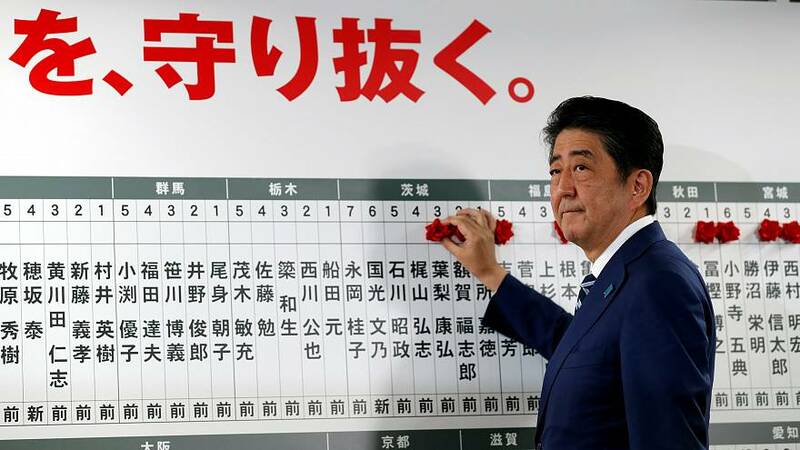 His conservative Liberal Democratic Party (LDP)-led coalition is tipped to be close to obtaining the two-thirds “super majority” it had in parliament’s lower house before it was dissolved. Abe is seeking a record fourth term in office to maintain his “Abenomics” growth strategy. He came to power in December 2012 promising to reboot the economy. The prime minister is also seeking a mandate to revise the post-war, pacifist constitution. He and his supporters on the right have long opposed the terms imposed on Japan after the Second World War. The constitution’s Article 9 bans the maintenance of armed forces, if taken literally, though governments have interpreted it to allow a self-defence force. Abe wants to develop a national army; critics fear an expansion of the military’s role overseas. Abe says a new mandate is needed to tackle a “national crisis” from North Korea’s belligerence and a fast-ageing population. A big election win would be a boost but a change to the constitution would still need a referendum. The prime minister’s main challenge comes from Tokyo’s Governor Yuriko Koike. Her conservative Party of Hope has absorbed much of the failed main opposition Democratic Party (DP), with calls for an exit from nuclear power and a freeze on a planned rise in sales tax. A new Constitutional Democratic Party of Japan (CDPJ) – another DP offshoot – is also vying to be the main opposition – though it’s thought neither will dent the ruling coalition’s dominance. The weather, dampened by Typhoon Lan which has battered the south, threatened to keep many people at home.